The fabric may be familiar to you . . . it’s from Heather Ross’ Briar Rose Jersey Knits line. It came out about a year ago and it was all over the place at the time – I feel like everyone was making cute things with them! Strawberries! Knit fabric! Cute! But since I’m not one to follow the crowd (*cough* I’m actually just super lame), I decided to sew with this fabric when it’s not so popular and no longer available. Haha. Just kidding. 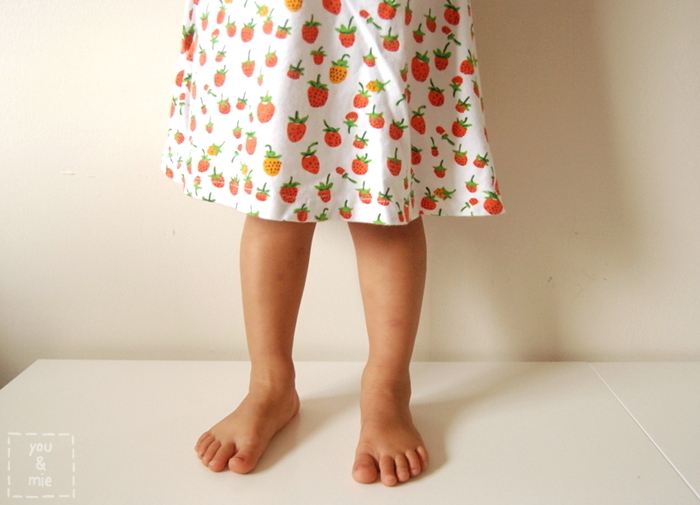 I actually found some of this fabric available here and also on Etsy. 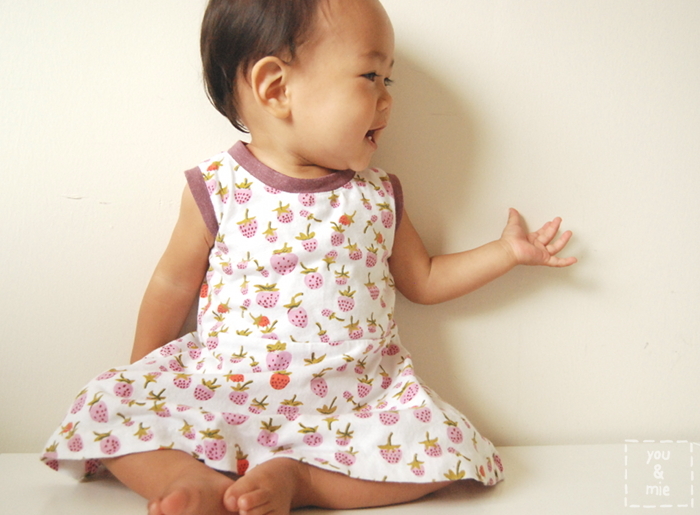 The pattern is the Skater Dress by Kitschy Coo. The pattern groups two sizes together (18m/2T, 3T/4T, etc.) so I feel like Yuki is a bit between sizes right now. The first Skater Dress I made for Yuki was in the 18m/2T size and while it still fits her, she’s definitely growing out of it. So I made the 3T/4T size and this one is a bit big on her. I kind of wish the in-between sizes were available also, but hopefully this just means she’ll be able to wear it for awhile. I modified the skirt by widening the angle a bit to be more of a circle skirt. I was hoping for more twirl for this dancer. And I added pockets. Always pockets for this one. Oh and I couldn’t forget little sister, could I? So Kaya got a little mini Skater dress! 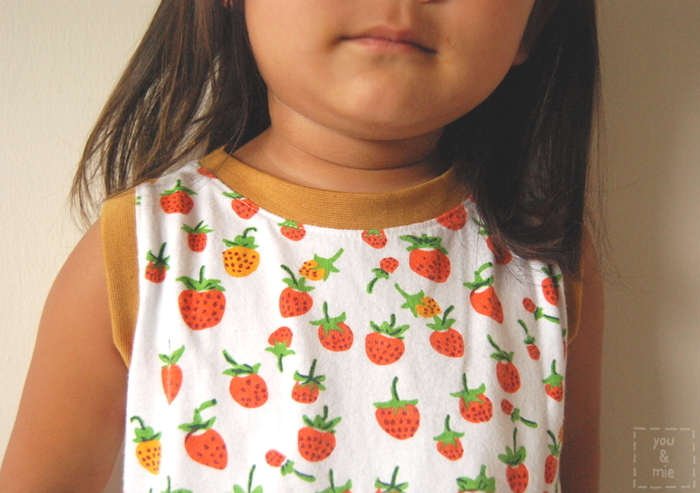 I used the FREE Little Skater Dress pattern that is available on the Kitschy Coo blog for sizes 6-12m and 12-18m. (though you’ll need the original Skater Dress pattern if you want the directions). I used the smaller size, but modified it to be even more mini since Kaya is so petite. I also redrew the armholes since the pattern is meant to have sleeves and I was making a sleeveless version. I love knit dresses. They are what Yuki lives in daily right now and pretty darn cute and comfy on the baby too! Right now, my two knit dress patterns are this one and the Soleil Dress. Any other knit dress patterns you guys recommend?? This entry was posted in sew & tell and tagged dress, girl, skater dress by Cherie. Bookmark the permalink. These are adorable! Love the matchiness. These are so sweet! I too didn’t follow the crowd and only just recently got my first Briar Rose but sewed with it soon after… I’m not sure there is much cuter than Kaya in that mini skater! Adorable! 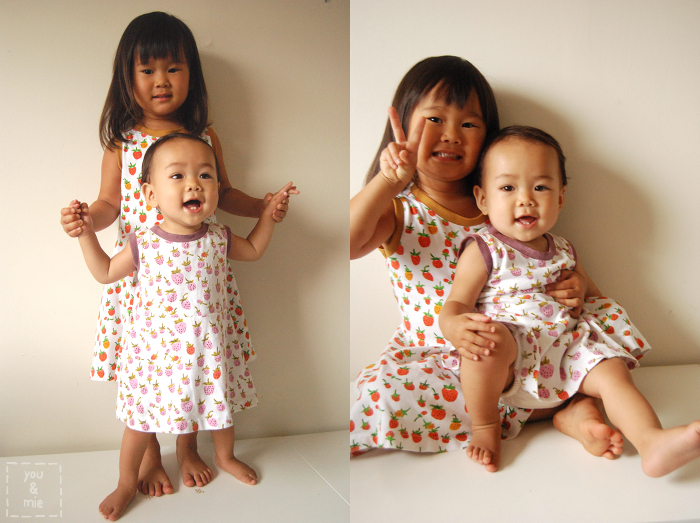 Such lovely dresses… It is fun (and practical) to dress sisters alike. I do it a lot! And this way I can always spot them when we go out. These dresses look so comfy! I have to start sewing knit dresses for my girls too. I love both of them. The strawberries are always so fresh and they are good for Christmas as well. My new favorite dress for knits is the Lemon Drop dress and tunic by Anna Marie Horner which just came out along with her gorgeous new knits. There is a woman’s size so you can do look alikes. I was lucky enough to attend Craft South and saw all the new knits up close. Beautiful. Love the fabric! There is still a store near me that stocks it and this is making me want to run down and grab it! You will find some knit dress patterns in your Japanese Sewing Books! I recommend one Ajaire sewed in my Sew Japanese series 🙂 Oops, sorry for putting commercial! Anyway, these dressed are super cute! Are you kidding me?? They both look soooo cute rocking their new skaters! And, confession time, I just HAD to have this fabric when it came out, and ….. still sitting in the stash. Just wish I could say that’s the first time that’s happened! Oops! double the cuteness! 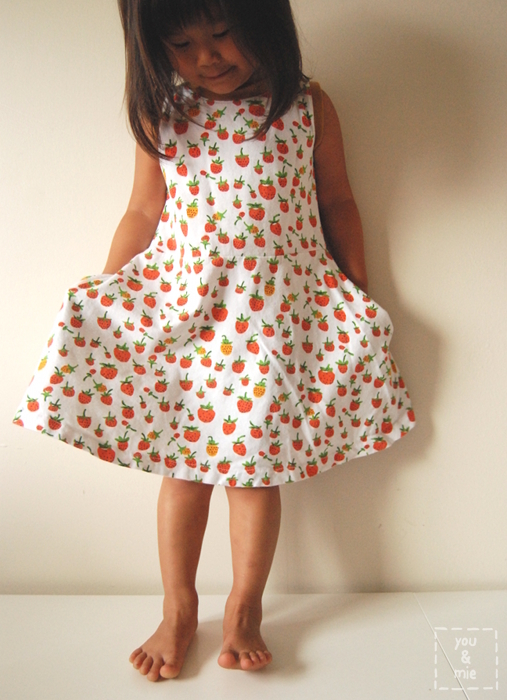 That’s such a great pattern – makes the cutest little dress with a fun twirl factor. Loved the ribbing colors you chose too.